How do you Reward Your Horse? This article from Horse Listening got me thinking about how I reward my horses. Whenever I ride my horses I try to focus on the things they do right. Sure, I sometimes growl at Zelda when she bucks, but given how hard our horses try to be good, it’s important to reward them. And even when they are not good, punishing may not do any good. Alfalfa cubes work for Zelda, too. Sometimes I can catch her with just one. Rewarding the positive made a huge difference when I started hunting Freedom. He had a hard time understanding the stop-start nature of the sport. Especially the stopping part. It’s unnerving when you pull up hard for the hounds and your horse spins, jigs and otherwise misbehaves. Unfortunately punishing a horse for not standing still doesn’t usually result in a horse that stands still. 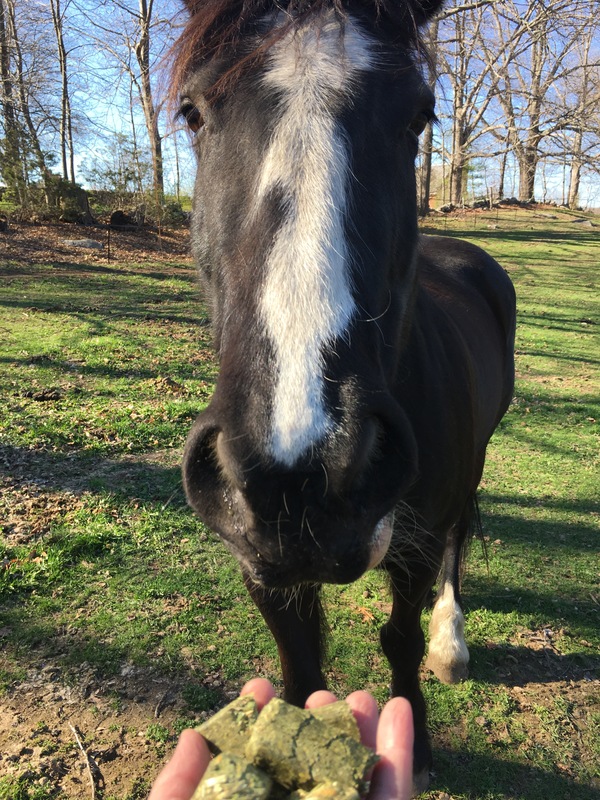 Although I’m not a huge fan of hand feeding horses, alfalfa cubes are my secret weapon. To teach Freedom to stand still, I filled my pockets with cubes and started slipping him one whenever he paused for a moment. He’s a smart horse. Before long, he was standing still and turning around to look for the treat. Although the bribery started while we were hacking at home it carried through to the hunt field. Other ways that I reward the horses are more subtle — letting them walk on a loose rein, rubbing their necks when they are doing well, and always remember to let go and soften when they give me the right response. How about you? How do you reward your horse?